Beirut and Mount Lebanon Chamber hosted on Wednesday a Lebanese-Cypriot-Greek business forum devoted to discussing the means to develop ties, especially at the level of business and investments, with the participation of Telecom Minister Mohammad Shoucair, Cypriot Foreign Minister Nikos Christodoulides, Greek Foreign Minister Georgios Katrougalos, State Minister for Foreign Trade Affairs Hassan Mrad, and Head of the Cypriot Commerce Chamber Christodoulos Angastiniotis. 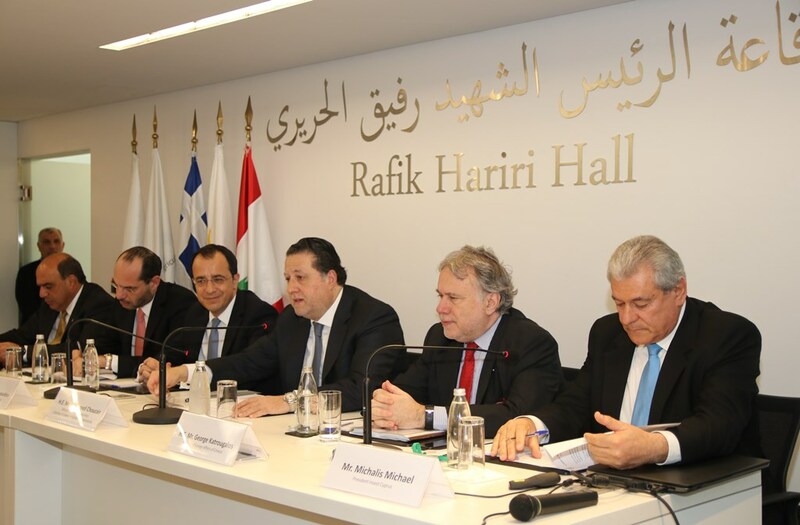 In his intervention, the Greek FM underlined his country’s commitment to enhancing relations with Lebanon, calling the Lebanese and foreign businessmen to invest in Greece, namely in the fields of energy, tourism, agriculture, and modern technology. He also highlighted the importance of the trilateral cooperation that involves Lebanon, Greece, and Cyprus, to revive the Silk Road. Echoing his counterpart, Christodoulides indicated that such cooperation would equally boost the political ties, renewing the Cypriot commitment to strengthen relations with Lebanon at all levels.